The “Valley of the Gates of the Kings” (to use its full title) is without a doubt one of the most important archaeological areas in the world, a royal necropolis for four centuries, with 64 known tombs, pits and caches. This is the definitive guide, with over 600 pages covering the Valley’s history, exploration, analysis, conservation and management. There are nearly 40 chapters (by 30 international contributors) grouped into themes, each packed with references, presenting the most up to date material available (although compiled before the current inconclusive scans of KV62 were announced) with updates to be published on the website of the Theban Mapping Project as new information becomes available. An initial introduction by Wilkinson and Weeks is followed by chapters detailing the geology and weather patterns of the Valley, an overview of the concept of a royal necropolis by John H. Taylor and exploration of earlier royal tombs and cemeteries by Aidan Dodson. Individual tombs are explored in separate chapters grouped by dynasty (with non-royal tombs covered by Susanne Bickel), with chapters on tomb construction and development, decoration, contents, mortuary ritual and symbolic aspects, destruction, desecration and reuse, administration of the Valley and the Valley’s history up to the twenty-first century and beyond. Robert Demarée and Andreas Dorn focus on the workmen who created the royal tombs, their tools, techniques and workplaces. No matter how skilled these men were, mistakes were made, as seen by the large number of ‘commencements’ and forced layout alterations as detailed by Lyla Pinch-Brock. One in four tombs in the Valley was usurped; Richard H Wilkinson discusses the various reasons for such reuse including attempts to gain status by association and, as is likely in the case of Tutankhamun, where someone died before their tomb was ready. Chapters by Aidan Dodson and Campbell Price explore sarcophagi, canopics and other tomb goods, while research carried out on the rich collection of human remains is detailed in a set of chapters by Rosalie David and Ryan Metcalfe, including a critical discussion of the problems of the recent DNA analysis work; the conclusion is that Tutankhamun’s family tree (in particular the identity of the KV 55 body) is by no means confirmed, although the use of next generation sequencing methods could provide a breakthrough. Tourism in the Valley is not a new phenomenon, with numerous travellers from across the ancient world visiting the tombs during the Graeco- Roman era; the most popular tomb was KV9 (Rameses V/VI) which was thought to be Memnon’s last resting place. The explorers of the eighteenth and nineteenth centuries are covered in a chapter by Joyce Tyldesley, who ends with the American Egyptologist Elizabeth Thomas, author of the first comprehensive record of the Valley, no doubt an inspiration to the authors of this new volume. Bringing us into the modern era, Adam Lowe looks at the role of recording and reconstructing tombs in sustainable tourism, Sarah Parcak and Gregory Mumford discuss the role that remote sensing technology can play in detecting archaeology in the Valley, while geologist Stephen Cross argues that there may still be tombs to find, with three Eighteenth Dynasty areas that have not yet been excavated down to the bedrock. It is fitting that the last chapter is dedicated to the people of Qurna, whose manual labour made the tomb excavations possible. Kees van der Spek discusses the role the Valley has played in the lives of modern Egyptians, ending with a Qurnawi folk story about the search for wisdom. As to what further secrets the Valley may hold, as the story teller says, “Patience is the Head of Wisdom”. Ostensibly the story of the acquisition, by the University of Pennsylvania Museum, of the second largest ancient Egyptian artefact in the USA (the largest being the Central Park obelisk in New York), this is much more than that. 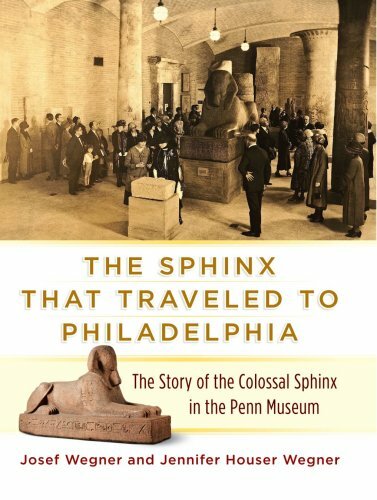 The book was written to commemorate the centenary of the sphinx’s arrival in Pennsylvania, and begins with a description of the foundation of the Egyptology collection, which owed much to the professional friendship between Sara Yorke Stevenson, the curator of Egyptian and Mediterranean archaeology, and Flinders Petrie. It was the Museum’s ongoing support for Petrie’s work that led to the discovery of the sphinx in Memphis and its transport to the USA in 1913. The work of the British School of Archaeology at Memphis is described in some detail as are the similarities in style between a pair statue of Rameses II and Ptah-Tatenen, now in the Ny Carlsberg Glyptotek in Copenhagen. Both were found in the same area of the Ptah Temple at Memphis. There follows a long description of the year-long journey of the sphinx from Memphis to Philadelphia via the Egyptian Museum in Cairo, by rail to Suez, on a German freighter across the Mediterranean and the Atlantic, initially to Virginia, and then onwards to its final destination, amid much media attention. It was installed in the garden of the museum for three years, but fears about damage caused by the weather caused it to be re-installed in a prime position indoors. The remainder of the book discusses further excavation work by the Museum in Memphis, including the unearthing of the remains of Merenptah’s palace, describes the ancient city of Memphis and ancient Egyptian sphinxes in general, and finishes with a full description of the Penn Museum sphinx and its role in the museum today. This is a beautifully produced work, lavishly illustrated, and will appeal both to lay readers and, because of its content relating to the excavation of Memphis, also to professional Egyptologists. University of Pennsylvania Press, 2015. This book examines evidence for the existence of the very familiar ancient Egyptian ‘scribe’ – and demonstrates that such a class of person did not actually exist. Based on the author’s Ph.D. dissertation undertaken at UCL, this is a perfect illustration of how misguided Egyptologists can be in their reconstruction of ancient Egypt. 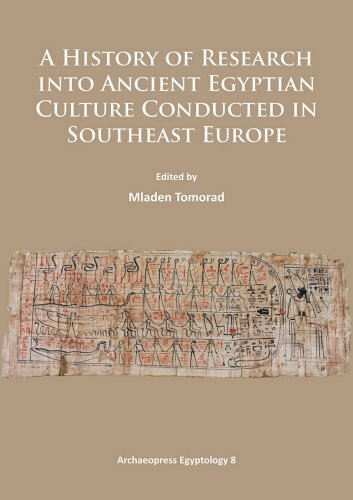 After a discussion of the key research questions, the author addresses the colonial context of Egyptology – more familiar territory for UCL scholars than most others – and how nineteenth century expectations of the literate ‘class’ separate from the ignorant masses were neatly mapped onto Pharaonic Egypt. The book is essentially a long-overdue critique of (to use Max’s often sparkling phraseology) “post-Napoleonic pseudo- Victorian elitist utopia.” Pinarello reviews in depth the archaeological context of writing ‘kits’ from UK museum collections – including several important examples in Manchester Museum – to establish that they apparently did not belong to one homogenous ‘scribal class’. The Old Kingdom site of Balat in the Dakhleh Oasis is used to test many of the assumptions built up around the idea of ‘scribes’ in ancient Egypt. As the author cogently argues, literacy is a broad spectrum and writing practice and comprehension can include a wide range of skills throughout society. Writing is likely to have been a performed role as opposed to signifying a distinct bureaucratic class. Many interesting observations are made, not just of application to Egyptology but to archaeological and anthropological case studies around the world. A particularly insightful discussion concerns the so-called ‘scribe statue’ form – which in fact seems first of all to have been a special privilege of royal princes in the Fourth Dynasty, emphasising status and closeness to the king, rather than necessarily showing the ability to read and/or write. As very often in Egyptology, the idea of the ‘scribe’ has become ingrained because it is so convenient. 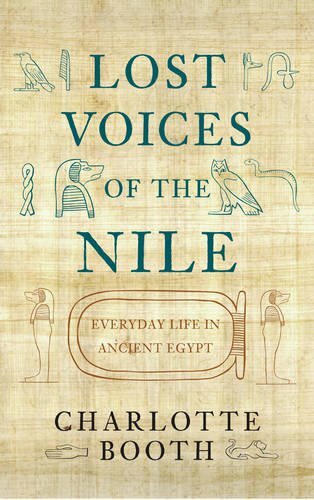 Schools and general interest groups are unlikely to detach from their use of it, but for those interested in the social reality of ancient Egypt this is an excellent survey of evidence. Egyptology is alive and well in Slovenia, Croatia, Serbia, Macedonia, Romania and Bulgaria, which each has its own important collections of ancient Egyptian artefacts. However, the research work from these South European countries is mostly unknown outside of the region. This volume sets out to redress this with a collection of papers from 22 scholars reviewing studies past and present and presenting sample catalogues from the various institutions. Mladen Tomorad from the University of Zagreb begins with an overview of 150 years of research in Croatia, and in a later chapter, explores the impressive collection of coins and other objects at the Archaeological Museum in Zagreb, while Emil Buzov discusses Egyptology in Bulgaria, a discipline slow to develop due to the country’s own rich ancient history and abundance of archaeology. Tomislav Kajfež recounts the life story of Josef Schwegel, a farmer’s son who became a nobleman, diplomat, politician and one of the most influential advisor to the Hapsburg monarchy; sent to Egypt, as the Austrian consul in Alexandria, he collected antiquities (now in the National Museum of Ljubljana) and sent ancient Egyptian monuments back to Vienna. Uroš Matić investigates whether or not there was a Minoan Princess in the New Kingdom Egyptian court, including interpretations put forward to explain the Tell el-Dab’a ‘Minoan’ frescoes. There are also papers covering the future development of a Croatian-Egyptian database to aid research, the Cult of the sacred Apis Bull, Isis and her affiliates in Dalmatia and the earliest evidence for the arrival of ancient Egyptian artefacts and cults in the region. The volume is well illustrated with black-and-white photographs, and has extensive bibliographies for each country represented, giving a comprehensive introduction to work and collections that deserve to be better known and appreciated by anyone with an interest in Egyptology. This is the second volume of Jason Thompson’s trilogy, the first covering from antiquity to 1881 (reviewed in AE91). The start date of 1881 marks the death of Mariette, the discovery of the Pyramid Texts and of the cache of royal mummies at Deir el-Bahri – the end date a watershed in world history as well as Egyptology. During those four decades following the battle of Tell el-Kebir, September 1882, the British transformed the administration of Egypt into a colony in all but name, but Egyptology was dominated by successive French Directors of the Egyptian Antiquities Service. British interests became prominent with the founding of the Egypt Exploration Fund in 1882, initially with biblical interest in Delta excavations and in Amarna. Subsequently other European nations founded their societies and institutions in Cairo, and America entered the field. 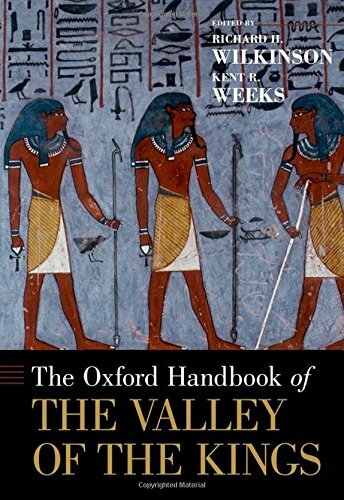 In a series of 13 chapters, Thompson succinctly describes how the foundations of Egyptological studies of today were laid, and the major discoveries made, some more by chance than controlled excavation. Some of the personal stories such as Carter’s standoff with authority (again French fuelled) and resignation are well known and here seen in the wider picture of the progression of Egyptology. Thompson well integrates all these events and provides full notes and bibliography to be able to pursue the finds and people further in greater detail. 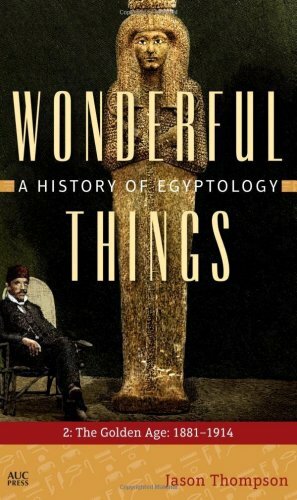 This is an incredible yet concise and most readable account of the really formative years in Egyptology. Thompson is the well-known author of major individual studies of some of the ‘greats’ (E.W. Lane, J. G.
Wilkinson) and his productivity is enormous. Hopefully it will not be long before the trilogy will be completed and become an essential and very worthy addition to the shelves of every Egyptologist, professional or dedicated amateur. One of my favourite things about ancient Egyptian material culture is the snapshot of daily life that we can see from certain objects. Whether enjoying a banquet, scribbling rude notes to each other or spending time with their families, it is clear that the Egyptians knew how to enjoy themselves when the occasion called for it! Playing board games, a pastime that seems to be undergoing something of a renaissance today, was also a common source of entertainment in ancient Egypt. 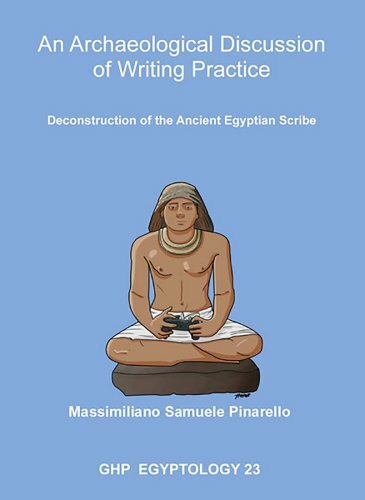 In this volume, the authors succeed in presenting a comprehensive overview of the archaeological, iconographical and textual evidence for ancient gaming from Predynastic to Islamic times, including the famous senet and mehen games. While providing an opportunity for amusement, board games are also known to have had ritual connotations. Senet in particular was closely associated with the afterlife: the word ‘senet’ is translated as ‘passing’, and this is linked with the passing of the ba through the duat as illustrated in the Book of the Dead. One of the most famous depictions of the senet game, also illustrated in this volume, shows Queen Nefertari playing the game in her tomb in the Valley of the Queens. While emphasising the challenges in interpreting the rules of such games based on limited surviving evidence, it is fascinating to learn more about the different gaming paraphernalia, such as throwing devices (dice and sticks) and the game boards, and how they developed over time. I am especially pleased that the authors also chose to illustrate more informal gaming traditions, when ostraca and stones were used as the basis for carving or painting a gaming board, showing us that the opportunity to play board games was available to everyone in ancient Egypt, regardless of their socio-economic position. 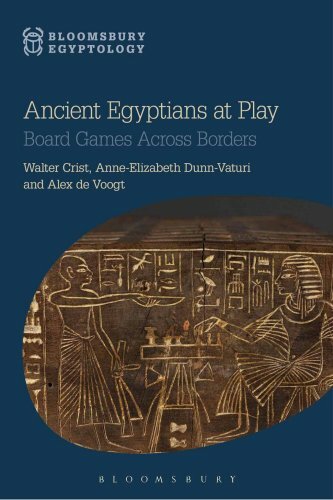 What is perhaps less well understood is the influence that ancient Egyptian board games had in the development of gaming outside of Egypt, particularly in the Levant and in Cyprus, and vice versa. The authors make a significant contribution to our understanding of how games were transferred across cultural borders, using archaeological evidence to discuss how Egyptian games may have spread to neighbouring local populations where Egypt was economically or politically active and beyond, particularly during the Graeco-Roman and Islamic periods. Richly illustrated with photographs and line drawings, this volume is a welcome compendium in the field of board game studies, and indeed is a great encouragement to crack open a board game and get playing! A large proportion of the material available to us from ancient times comes from funerary contexts. Naturally this tends to reflect the lives of their owners who were often from the upper classes. In the early days of Egyptology the lives of ordinary people were well-nigh invisible, but over time the subject has developed and the ordinary Egyptians have emerged from this research as living, breathing individuals, much like ourselves. 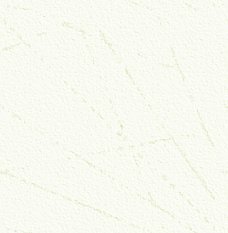 This new study of life in Egypt is very readable and detailed. It takes its material from many of the most widely known sites such as Deir el-Medina and Lahun but gives a new slant to the available evidence from archaeological and written sources. A comprehensive range of aspects of daily life is covered, from childbirth and women’s problems, through relationships, social and leisure activities, religious activities, both public and domestic. It continues through medical and dental care to the final processes up to and after death. Interesting light is shed on such matters as sexual orientation and the interpretation of dreams. We meet many of the named inhabitants of ancient Egypt through their actions recorded in legal records, on tomb walls and through huge numbers of ostraca retrieved from rubbish tips in Deir el-Medina. Excavation of houses in domestic settlement sites has produced artefacts and other remains which provide fascinating insights into the lives of ordinary people. One example, the house of the ‘keeper of cattle’ at Amarna, Panhesy, produced huge quantities of animal bone providing a new understanding of the work of the butchers of the period. Recent research is included such as the study of the Djekhy and Iturekh archive which includes an account of a financial transaction in which an embalmer named Hepy borrowed a sum of money and used all his possessions and even his children as collateral. This kind of example, one of many quoted, brings the ancient Egyptians vividly to life. Each chapter has a series of footnotes giving the sources of the evidence quoted. For the general reader this information might have been more easily accessible had it been presented as a straightforward bibliography, but the range of sources used and the scope of the work is impressive making for a good read. Reisner first suggested in 1908 that the rapid evolution of tomb structure was driven more by the need to build increasingly complex anti-robbery components than religious requirement or funerary practice. Widespread tomb robbery from the earliest times forced the elite to develop a series of innovations to outwit those that would deprive them of their afterlife luxuries, in an ongoing ‘arms race’ between tomb builders and tomb robbers; sadly most attempts to deter looting failed. 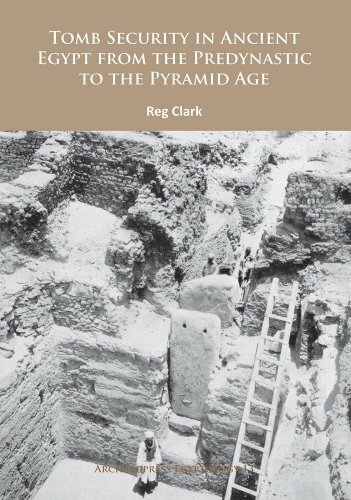 In this comprehensive volume, Reg Clark presents the first in-depth analysis of the architecture of tomb security, covering published royal and private tombs from across Egypt, from the Predynastic through to the early Fourth Dynasty. He explores the special methods employed to protect the tomb (such as concealed stairways, portcullises, filled shafts and slab roofs), creating the first searchable database of security architecture. After initial chapters covering the purpose of the Egyptian tomb, typology and methodology, there are separate sections investigating the chronological development of the burial chamber, and the security of tomb access routes and superstructures, leading to the conclusion that, as these security features evolved, they were widely adopted and became part of the mortuary architecture to an extent that their original role as cutting edge security mechanisms is often forgotten. Packed with plans, diagrams, black-and- white photographs, an extensive bibliography, reference charts and a comprehensive illustrated tomb catalogue, this is a go-to text for anyone studying the development of the Egyptian tomb. Read more about tomb security in Reg Clark’s article on page 42 of Issue 96.